Publishers Johnston Press and Trinity Mirror have agreed a new print deal. 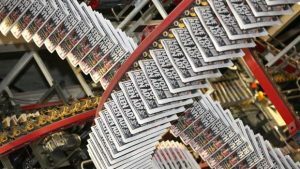 In a joint statement, the publishers said the new deal “contains improved terms for printing the i newspaper, including operational benefits and improved commercial terms”. Johnston Press had agreed a new three-year print and distribution contract for the i newspaper across Trinity Mirror Print sites. The “mutually supportive” agreement will also see Trinity Regional titles, formerly Local World, extend its existing print contract at Johnston Press sites in Portsmouth and Sheffield until December 2020. Johnston Press, the owner of The Yorkshire Post and Sheffield Star, last week posted a 16.8% decrease in operating profit for the first half of 2017. Its chief executive, Ashley Highfield, said: "It is important, in this current media climate, to look for ways to work together to stabilise and strengthen relationships in the UK newspaper market. "We are therefore delighted to confirm that we will be working with Trinity Mirror for a further three years, in a mutually supportive printing arrangement. The operational benefits are important and will be particularly helpful as we look to develop the Saturday issue of the i newspaper." MEN and Liverpool Echo publisher Trinity Mirror recently increased its costs savings target for the year from £15m to £20m after announcing a sharp decline in revenues and profits for the six months to the start of July.